Home / Archive by category "Featured Homes/ Listings"
Drop in to see one of the most desirable Foothill Ranch real estate listings. 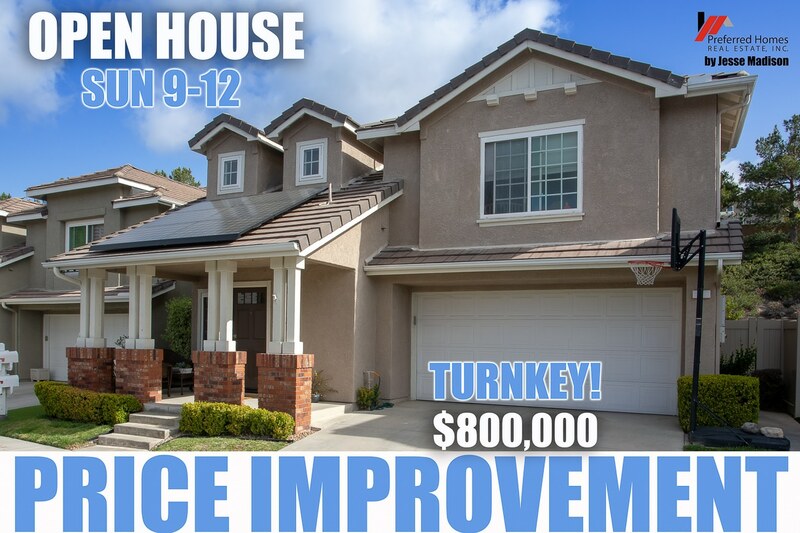 Open House Sunday 9-12 7 Embassy, Foothill Ranch, CA. Price Improvement! This home has it all! Enjoy this fantastic floor plan with newly remodeled kitchen. Quartz countertops and white subway tile backsplash give this kitchen that clean, light and bright feel. Stainless appliances and breakfast bar compliment the upgraded feel and look of the home. New paint, ceiling fans, crown moulding and extra storage built ins in formal living room. Enjoy huge savings every month with owned Solar Panels. Once you buy the home you will not be paying any solar panel bills as they come with the home. Separate family and living room, Both formal dining area and kitchen eating area. Cozy fireplace in family room. Newer double paned vinyl windows and large slider to backyard, Recessed lighting throughout, Laundry chute from upstairs down to laundry room, Upstairs you will find 4 Bedrooms, a loft and a spacious master suite that spans the whole length of the home with private Master Bathroom featuring separate shower and tub. Stand up attic storage above. Backyard is complete with BBQ island for this great family gatherings. Excellent private location on a very low traffic street perfect for those seeking peaceful surroundings or for young families. An option to add an enclosed office adjacent to the master bedroom is still available. 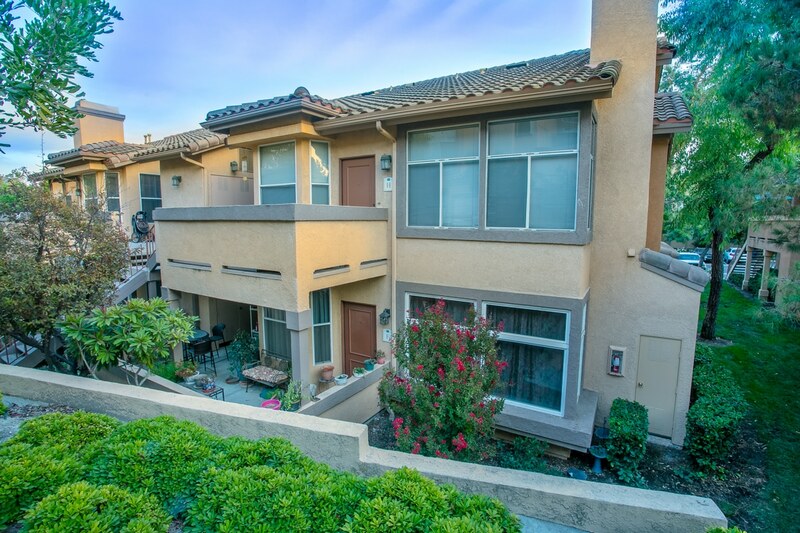 Located close to Foothill Town Centre with movies, restaurants, shopping and more! Enjoy the award winning schools, hiking trails, wilderness parks and lifestyle in Foothill Ranch. Foothill Ranch real estate is highly desirable in South Orange County due to award winning schools, Quiet and safe communities with ample shopping and entertainment in the Foothill Ranch Town Centre. The Town Centre features various big box chain stores and many smaller mom and pop businesses. Truly a perfect mix and a large Regal Cinema chain with top notch services easily accessible for all Foothill Ranch real estate listings. Join us at 31231 Calle Del Campo , San Juan Capistrano, Open Sunday 12:30-3:30pm. Recent renovations completed! See this 4 Bedroom 2 bath single level pool home! 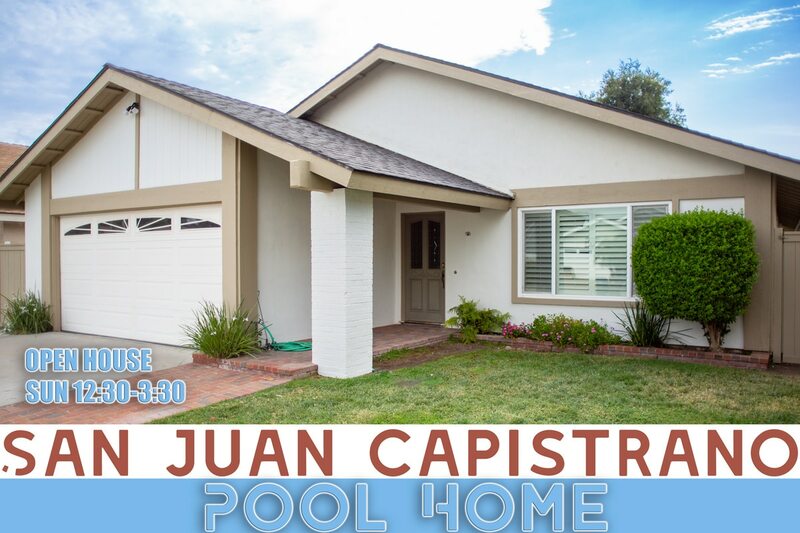 Welcome to this wonderful single level pool home in the desirable San Juan Capistrano community of Mission Glen. Must see the recent improvements made by seller. Seller has replaced the fascia board and wood trim surrounding the home, New beams in entryway and garage area. New exterior paint. New fencing all around, new gas line installed from gas meter to pool equipment. Enter into a large and spacious formal living room with vaulted ceilings and plantation shutters. Also enjoy your separate family room with fireplace which opens up to the kitchen and dining area. kitchen has an open feeling with coffered ceiling and recessed lighting. There is also a long breakfast bar perfect for family gatherings. This home was remodeled to 3 Bedrooms and a large den but can easily be converted back to 4 bedrooms, Newer heater and Central Air Conditioning, Sparkling Pool for those warm summer days, Hardwood Floors, Vinyl windows with 2 large sliders with backyard access. Newly repaired fences and fascia boards, Recessed lighting, Great location inside the tract and community RV access available. Close to everything! Walk to parks and enjoy nearby shopping , the Mission District and downtown restaurants and entertainment. Truly a great opportunity for this single level pool home. 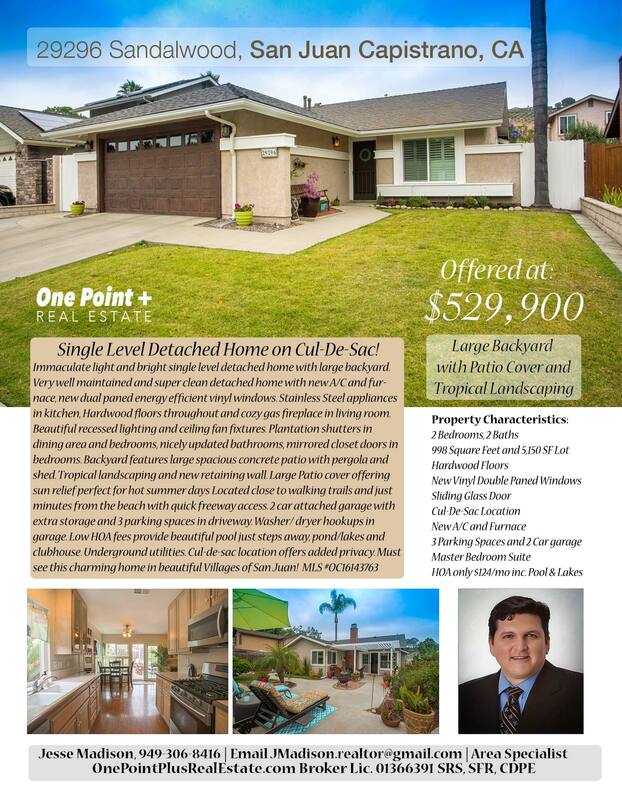 Call Jesse 949-306-8416 for a showing! or dm on facebook or IG @ocrealtorjessemadison. Beautiful Luxury Irvine Condo with Refinished Natural Wood floors! 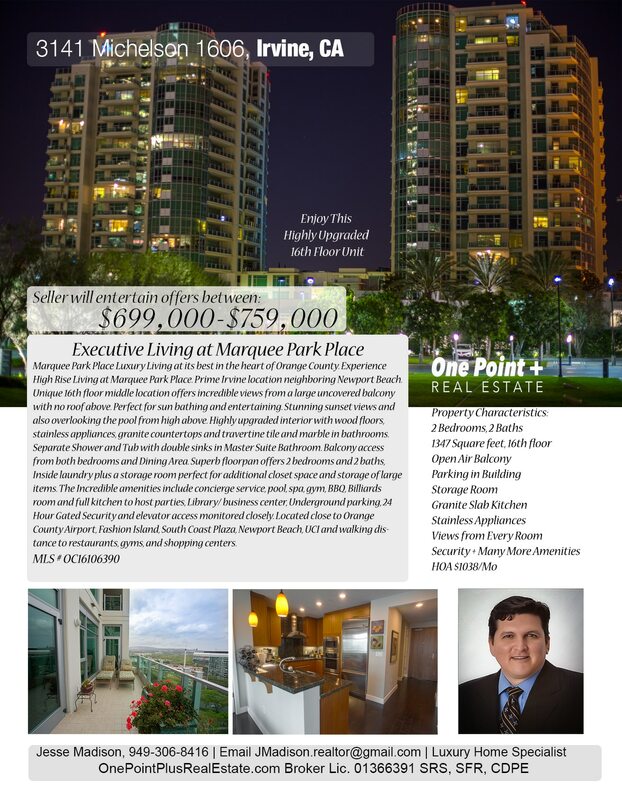 Wonderful 16th floor location at Marquee Park Place. Prime Irvine location neighboring Newport Beach. Enjoy incredible views from a large open air balcony with no roof above (Building is 18 stories). Perfect for sunsets, lounging and entertaining. Stunning sunset views from this open air balcony unit. Also overlooking the pool from high above. Highly upgraded interior with wood floors, stainless appliances, granite countertops, travertine tile and marble in bathrooms. Separate Shower and Tub with double sinks in Master Suite Bathroom. Balcony access from both bedrooms and Dining Area. Superb floorpan offers 2 bedrooms and 2 baths, Inside laundry plus a storage room perfect for additional closet space and storage of large items. The Incredible amenities include concierge service, pool, spa, gym, BBQ, Billiards room and full kitchen to host parties, Library/ business center, 2 car Underground parking, 24 Hour Gated Security and elevator access monitored closely. This luxury Irvine condo is very close to Orange County Airport, Fashion Island, South Coast Plaza, Newport Beach,walk to shops/restaurants. Luxury Irvine Condo listed at $699,000. 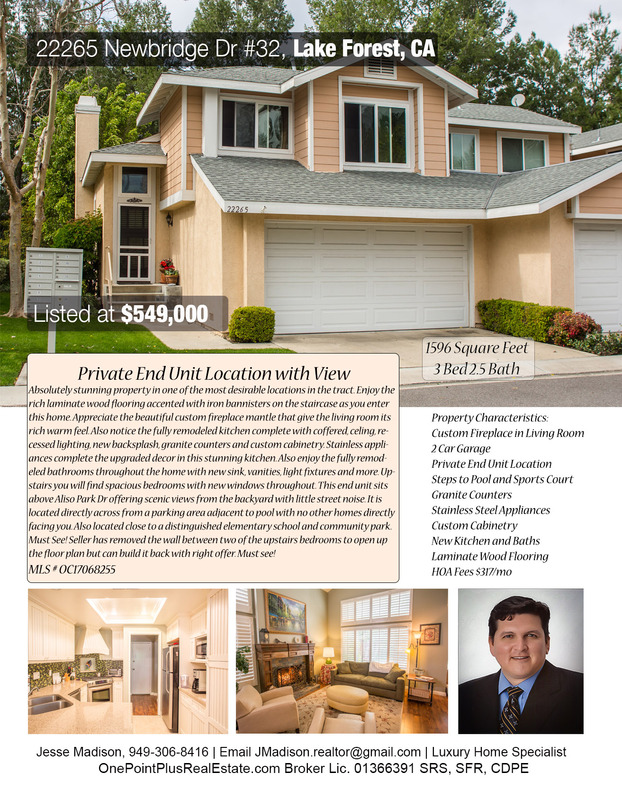 For a private showing call Jesse Madison at 949-306-8416. Seller saved over $10,000 with Orange County Discount Broker! 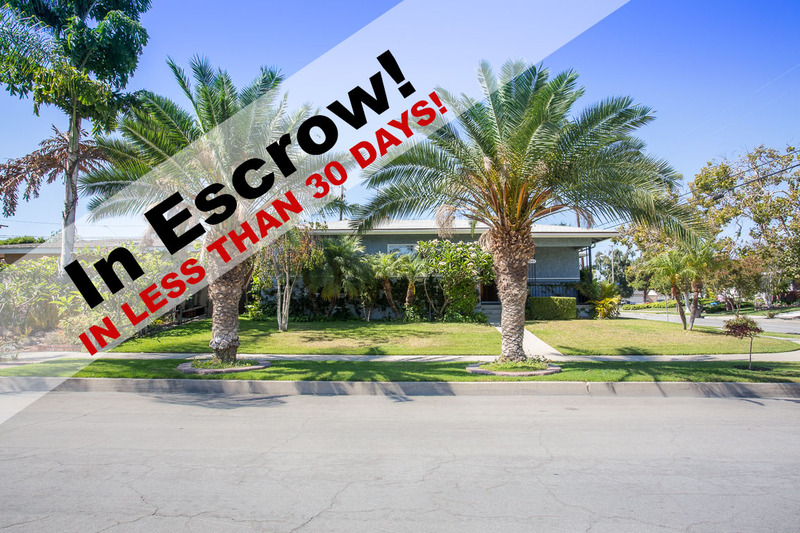 In Escrow! Our seller just saved over $10,000! He listed and sold his property in under 30 days allowing him to list the home for sale for just 1%! Learn more about how you can save thousands when selling you home with One Point Plus Real Estate. Home Sellers want the opportunity to save money by listing their home and selling quickly for a low cost…One Point Plus Real Estate is the answer. Your full service Orange County Discount Broker. Quick sales often happen when the market conditions are right and the home is priced to sell. One Point Plus Real Estate SAVES you money by listing your home in the MLS with Quality Media and Photography for a low fee of 1% for the initial 30 day listing period (plus selling agent commission of 2 or 2.5% depending on current market conditions). We eliminate the risk of paying huge sums of money to a broker for a quick sale! This seller saved over $10,000 by taking advantage of the 1% list fee One Point Plus has to offer. What happens after the initial 30 day period? If the home does not go under contract in the initial 30 day period, We then offer our extended Marketing Plan at a slightly increased rate to cover increased marketing costs. During our initial listing period we provide Full Service Marketing which includes quality photography, videography, open house and advertising to ensure your home gets sold quickly at an affordable discounted rate. How much will the broker charge for a showcase listing on Realtor.com? How much will the broker charge for a Comparative Market Analysis (CMA) ? Will my listing be in the MLS and featured on all syndicated MLS websites such as Zillow, Trulia, homeseekers.com and other websites? Will my listing have high quality digital photography and Video? Will One Point Plus Real Estate manage my transaction, contract negotiations and timelines? How much commission does the listing broker charge after the 30 day initial period? Just Listed! 4 Bedroom home near CSULB! Beautiful and spacious single level home near CSULB with open floor plan. Large spacious upgraded kitchen with granite counters, recessed lighting, custom cabinetry, crown molding and Hardwood floors. Plenty of windows makes this kitchen and dining area light and bright and perfect for dining and entertaining. Enjoy the cool breeze on the covered front porch as you gaze at the palm trees and lush landscaping. 3 spacious bedrooms with plantation shutters and one large add on Family room which could be converted to a large 4th bedroom. Real hardwood under the carpet in bedrooms and hallway. Large living room with cozy fireplace with mantle. Large Patio cover offers plenty of shade over concrete patio and still plenty of yard space with grass area. Perfect for large family gatherings. 2 car garage with driveway offers plenty of parking. Beautiful landscaping with Large Palm trees and fruit trees including chirimoya and olallieberries, Organic raised bed vegetable garden, Shaded back yard with hummingbird nests, Monarch butterfly plants attract constant stream of butterflies. Close to El Dorado Park. Award winning Long Beach Unified School District. Fully Automatic irrigation system with 30% water saving sprinklers, Must See! Looking to Sell? List for 1%! Call Jesse and learn more about our programs! Just Listed! Single Level Detached SFR in OC! Looking for a single level detached SFR home in OC? Jump on this chance to own a single level detached SFR in OC! Immaculate light and bright single level detached SFR home with large backyard. Very well maintained and super clean detached home with new A/C and furnace, new dual paned energy efficient vinyl windows. Stainless Steel appliances in kitchen, Hardwood floors throughout and cozy gas fireplace in living room. Beautiful recessed lighting and ceiling fan fixtures. Plantation shutters in dining area and bedrooms, nicely updated bathrooms, mirrored closet doors in bedrooms. Backyard features large spacious concrete patio with pergola and shed. Tropical landscaping and new retaining wall. Large Patio cover offering sun relief perfect for hot summer days Located close to walking trails and just minutes from the beach with quick freeway access. 2 car attached garage with extra storage and 3 parking spaces in driveway. Washer/ dryer hookups in garage. Low HOA fees provide beautiful pool just steps away, pond/lakes and clubhouse. Underground utilities. Cul-de-sac location offers added privacy. Must see this charming home in beautiful Villages of San Juan! 5 Star Testimonials on Yelp and Zillow.com! Luxury Living at Marquee Park Place Irvine, CA. Seller will entertain all offers from $699,000-$759,000. This is your chance to own in one of the premier luxury buildings in the city of Irvine, CA. Highly secure guard gate buildings with 2 car garage parking in building. Beautiful 2 Bedroom, 2 Bath home on the 16th floor at Marquee Park Place Irvine. Experience the life of luxury in the heart of Orange County. Close to Orange County Airport SNA. 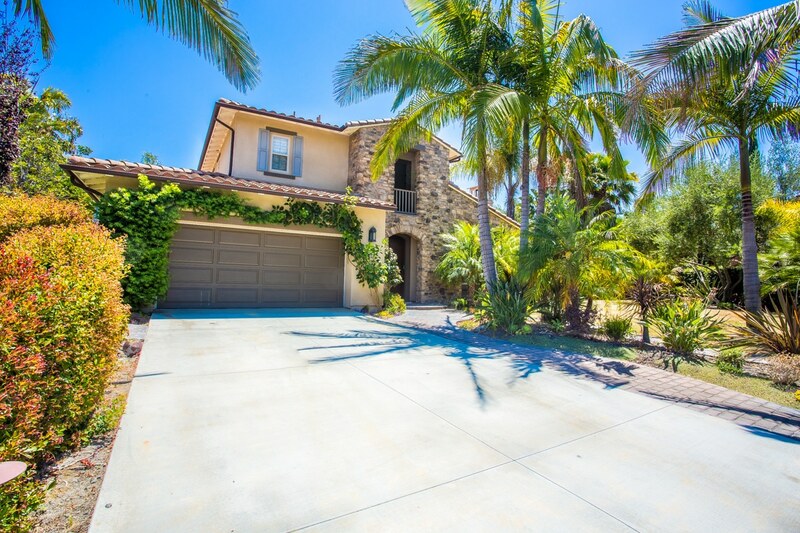 Prime Irvine location neighboring Newport Beach. Offers incredible views from a large uncovered balcony with no roof above. Perfect for sun bathing and entertaining. Stunning sunset views and also overlooking the pool from high above. Highly upgraded interior with wood floors, stainless appliances, granite countertops and travertine tile and marble in bathrooms. Separate Shower and Tub with double sinks in Master Suite Bathroom. Balcony access from both bedrooms and Dining Area. Superb floorpan offers 2 bedrooms and 2 baths, Inside laundry plus a storage room perfect for additional closet space and storage of large items. The Incredible amenities include concierge service, pool, spa, gym, BBQ, Billiards room and full kitchen to host parties, Library/ business center, Underground parking, 24 Hour Gated Security and elevator access monitored closely. Located close to Orange County Airport, Fashion Island, South Coast Plaza, Newport Beach, UCI and walking distance to restaurants, gyms, and shopping centers. Also for lease at $3400/mo. Call Jesse to schedule a showing today! 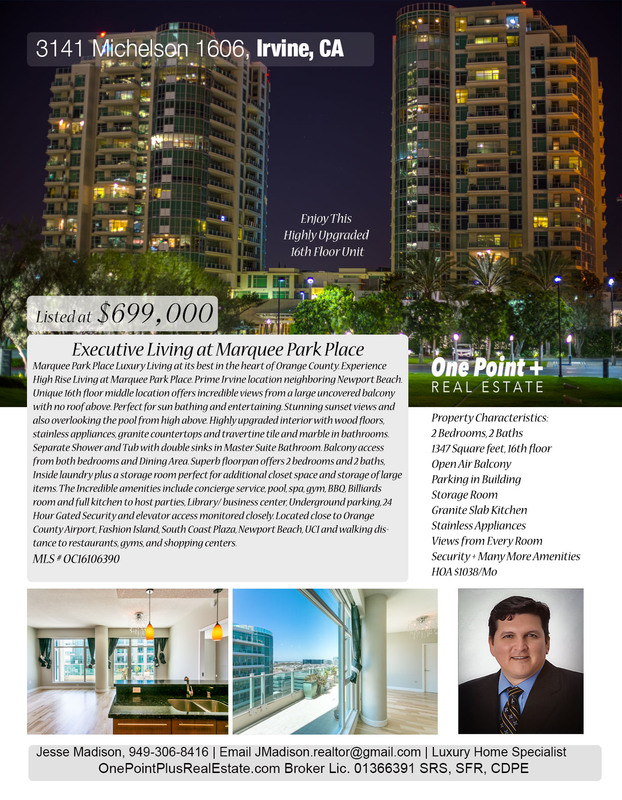 One Point Plus Real Estate, Inc.
Each spacious, luxuriously-appointed residence at the Marquee Park Place Irvine includes high ceilings, full height windows framing expansive wall-to-wall views, cozy gas fireplaces and spacious entertainment-size balconies and decks. The finest materials and fixtures are featured including quality wood cabinetry of either cherry, walnut or zebrawood with granite countertops; professional quality stainless steel appliances; Kohler fixtures and faucets; rich flooring in hardwood, limestone, marble and berber loop carpet.